Picture Frame in Black Plastic, 24" x 36"
Inexpensive Picture Frame - This picture frame is engineered for an economical price point: it is a cheap picture frame, discount picture frame! Do not purchase for upscale locations, as in hanging posters in "bank lobbies". 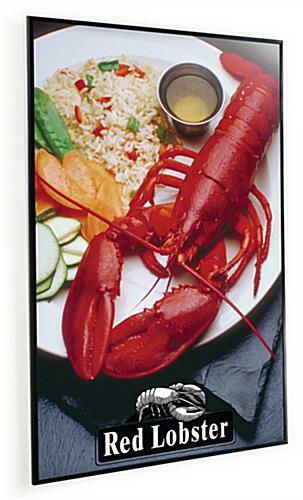 For more upscale environments, our company offers many other acrylic or aluminum framed picture frame displays. A great solution for your daycare or classroom! Use this picture frame to display student artwork or educational posters. 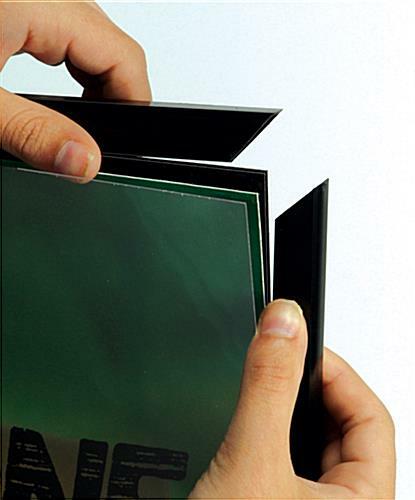 It comes with a non-glare overlay that helps to shelter the the contents from dust and other damaging agents. Easy to assemble! 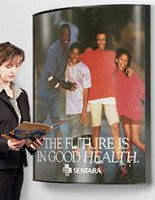 Lay your 24" x 36" poster on the plastic backboard and then place the non-glare sheath over the poster. Then slip the black plastic mouldings on each side. Note: the black perimeter frame moulding covers up to a 5/8" visual location on all four sides of these poster. This picture frame includes two hanging brackets mounted on the backboard.